Welcome back Hypertransitory readers, you’re just in time for another Hypertransitory Mystery -this time it’s the mystery of the unexplainable Google PageRank. I never really stressed too much over PageRank, mostly because I didn’t understand it and didn’t really care to. Then one fateful day I got an alert from Google that my site had been promoted to PR4. Some SEO site was trawling the web for places to request links from, I guess. They published my address along with a bunch of others on their site and Google picked it up. After that I started getting annoying link requests (some of them downright sleazy), but aside from that not too much changed. So the homepage of Hypertransitory.com is PR4. Mind you, it’s just the home page, my entire site is not PR4. Most of my pages have no rank at all. The drama started when I was doing some minor maintenance on my online novel site True Tales of the Soryan Order. Imagine my surprise when I glance at the Google Toolbar and see that the homepage of that site is a PR5! Not believing it, I also checked in the Firefox add-on SEO Quake. It gave me the same results. Hrrm. So Google is thinking that the front page of my novel site, which maybe gets 100 hits per month and is relevant only to itself, really, is more important than the front page of Hypertransitory. Even though Google tells me not to worry about PageRank, I’m just very curious as to why this is. Here’s some of the factors I investigated trying to get to the bottom of this. BACKLINKS: Checking the backlinks for Hypertransitory (using SEO Quake) and it came up with about 24 Google backlinks, most of those links are PR0, with one PR3 and one PR5. Doing the same thing for soryanorder.com, I get about 9 results from Google, most of which are actually from Hypertransitory and from soryanorder.com itself! For some reason there were dramatically more backlinks showing in Yahoo. I’m not sure if this is something Google takes into account? Not that backlinks are all that counts for PR. Doing some detective work, I found this PageRank article from Smashing Magazine. It’s from 2007 but I still read through it to try to figure out the disparity between the rankings of the sites. The things is, Google is so secretive about this stuff that much of it ends up being speculation and not fact. AGE: Hypertransitory.com is definitely older than Soryanorder.com. I bought Hypertransitory all the way back in 2002, while Soryanorder.com was purchased in 2010. Hypertransitory has not been *active* all that time, though, but for longer than soryanorder.com. UPDATES: I usually update this site about once a week these days, but soryanorder.com really hasn’t been updated since last fall! It can’t be that important, can it? OUTGOING LINKS: If you check my Hypertransitory home page, there’s a ton of links going out. Maybe it’s bleeding PageRank away instead of keeping it for itself? Whereas the Soryan Order home page has far fewer links going out. Could that be the key? This is an article I found that explains the “PR leakage” issue in layman’s terms (from 09-2010). Does this even matter? I checked out this article from Info Carnivore about Google’s 2011 Official Stance on PageRank, where he states that Google has downplayed the importance of PageRank (which is borne out by the link to Google’s own site above). It doesn’t really do me much good to have my novel site be PR5. I guess I’m happy that Google considers it that important, but I’m the type of guy that likes to know why, and it annoys me that I can’t see a clear reason for it. Honestly, that site should probably be a PR0, and maybe a PR1, and this site that I actually put work into should be PR5, but again, I don’t think there’s any clear benefit to me even if it was (unless one of the spammy link offers turned out to be above board, I guess). So I think this one is going into the Robert Stack pile of Unsolved Mysteries, for now. I may play around with the links on the Hypertransitory home page just to see if I can affect the ranking at all. According to several of the links above, the toolbar isn’t updated regularly anyway, so I might not see the results for a long time (even though Google will still factor in your site’s true PageRank when ranking the pages, not the delayed one in the toolbar). If anyone has any insight on the nature of PageRank or can see exactly what’s going on with those pages please feel free to let me know. Obviously I just took a cursory look but I’m sure SEO pros must have other methods to investigate. Google really prides themselves on being able to discern what is really good, unique, authoritative and relevant content, and these are the nature of sites they want to reward. My only guess with your novel site and on why it is ranking so well is because it is absolutely 100% one of a kind. There is no chance of duplicate content, in addition at a glance it appears to be completely advertising free. Google will reward sites like this because they believe they are genuinely providing quality information, traffic won’t be a big consideration in the ranking process there. Backlinks are a factor, but the sheer number of backlinks are not the bottom line, more important are the quality of the backlinks. Of course you mention that your novel site doesn’t have a whole lot of backlinks at all. Google won’t reveal all the backlinks it finds, so you can never look at that list as being complete. I don’t think your primary site is leaking pagerank, especially if you are on the same host. It is somewhat of a mystery, but that’s what makes pagerank so special. Thanks for referencing me in your article! hi Daniel, thanks for dropping in here! Well that sheds some new light on the situation. I certainly didn’t realize Google was not displaying all the backlinks. Maybe they have to do all this stuff to keep SEO experts at bay? And you’re very welcome for the link, your site was a great resource for me when I was trying to suss this out! I think the whole backlink thing can be really misleading – I’ve had sites rank really well with 3 backlinks beating other sites with thousands. The key was getting links from relevant sites. It is better to get a single guestpost on a relevant blog than 100 links on random blogs. Lol I have the same thing going on. My humor blog is a 0 with the most activity, posts, social media interaction. And my business site that is completely neglected is a 1. None are very old. However my 0 sites has tons of do folllow links out, so that could be it. I like looking at the Mozrank which I believe is more accurate. It’s a 5 according to that and business one is lower. That makes more sense. I think Mozrank is being looked at more these days for a better picture. Meh.. I don’t worry about PR. Hey Melinda! I could certainly see your site being a 5, that’s sounds about right to me. I never checked the Mozrank before, so I went to take a look. Guess what? The homepage of this site here is a 4.35, while my novel site is a ZERO! Actually that’s pretty much what I expected, lol. Mozrank FTW!!! I just noticed they updated page rank and now mine makes more sense (3). They seem to be more correct on all my sites now based on activity and links. None of my sites changed at all. Still as confusing as ever. Oh well, at least they didn’t drop! A lot of good people/blogs got PR upgrades today so that’s cool with me. Anyway, enough about Page Rank. This is my first time on your website, and I can only say it’s great resource, cause design really catches attention, add to that good writing style and comic like feel, we’re talking about real standing out from the crowd. I still don’t really have a true understanding, but it seems like Google just doesn’t want people to understand it so it will always be shrouded in mystery…maybe rightfully so to keep people from gaming the system. Thanks much or the compliments and I’m glad you liked what you read here, that’s what it’s all about, man:) I will be seeing you around! Hi Calli, thanks for leaving that link I will definitely check it out! I can see this is not a clear-cut case so maybe I won’t put my magnifying glass away just yet and I’ll keep investigating. I’ll have to go CSI on this thing! Hey John, how’s it going? I ran your site through SEO Spyglass which is a tool that pulls backlinks from many different sources besides just Google and Yahoo and then assess their value. I found just under 300 links for the Soryan Order site versus around 1300 for this one – so you’re right about thinking this site should have a better page rank. But you actually have a DoFollow link from a PR 7 page – without going into mumbo jumbo tech details, this would be the equivalent of having over 600 unique PR 3 links. PR 5/6/7+ links transfer LOADS of Pagerank – and this is why the PR seems higher than it should be on the Soryan Order site. I’m sure that was keeping you up at night, so hopefully that helps you out. Now it begins to make a lot more sense. I suspected that I was not seeing the whole picture somehow. Damn, I shoulda done this site in Joomla, I guess lol. Thanks for the info, I appreciate you taking the time to investigate! Excellent investigation John. It’s really very hard to tell what’s happening on Google especially on how it determines PR. However, the tips you’ve given make sense and yes, outbound links deteriorate the authority of a page. Hi Jill, I’m often surprised people can make heads or tails of this SEO stuff. I might clean up some of my outbounds just on principle. I don’t expect the PR to actually benefit me in terms of traffic, but I might as well try to get it higher just for braggin’ rights. Wow, looks like you did a lot of researching on that. However I know what you mean about losing that spot. I’m still not where I want to be, but your tips have helped me to keep a research going. Sometimes I feel like Google has a mind of its own. Good luck! I cant give you the answer in a comment, I dont think anyone really can but I can say that I have experiances. One site I have worked on for years in terms of link building and content and the other I just use to run and test php scripts on, the “proper” site is a pr 1 but the test site that has never had anything of meaning on it and I have never built a backlink has a pr of 3. Hi Danika, so yes you have the same experience, essentially. When you’re doing all the stuff you’re “supposed” to do for one site and the site you don’t care about surpasses it you’re forced to wonder what the heck is going on! People who really understand this stuff have my respect, no doubt. Thanks for commenting! Hi Hongvan. I think several of the commenters here provided much more valuable info than I did! But I feel your pain. I know linkbuilding is tough, especially with such high requirements. I learned a lot about PR from the comments and I can now see the value those higher ranked pages can provide. Thanks for commenting and good luck with your efforts! I compared the two domains in Open Site Explorer. What showed up was that most of the top 10 links to hypertransitory.com were no-followed and for http://www.soryanorder.com they were do-followed. I think like Daniel Snyder said in the first comment that Google is giving more weight to the do-followed. All interesting stuff. Hi Sharon, thanks for taking the time to check this out and corroborating Daniel’s great info. I never knew about Open Site Explorer, I think I’ll have to add that to my arsenal. Some great info has come from these comments. Things are going to be up in the air for the google results. panda is an ongoing update that will have some kinks that are needed to work out of it. It even affects pagerank too! Great post John and thanks for sharing this one with me. You are right though, trying to really figure out Google is beyond me. If they claim themselves that it’s not that important than why have it at all? What’s the point? Ah to hell with it. I’m going to go about my merry way doing what I’ve always done and I guess we’ll see down the road how it all turns out. Hm.. i never been in your position before though. And the trouble here, I think it’s all done by Google dunno how. I have also a problem in my site about building up my page rank. I am now searching for the great tips to know more about this topic, and I chose your post to be one of helpful blogs I read. Thanks for the share. Thanks for dropping in here. I don’t have all the answers but I share whatever I can get. all the best! You seem like naturally have an inquisitive mind. But I don’t know the answers why a certain site will suddenly have a high pagerank. Hey John – It’s so weird, because just a while ago my homepage was a PR 4 with several inner pages at PR 3, 2, and 1. Of course, the primary determiner being inbound links but a lot of other factors. Tonight, my homepage is showing a PR 3. I see yours as PR 3, too. Maybe something’s wrong with my toolbar? I don’t get it. I wonder if they re-updated and downgraded a bunch of sites? Hey Tia, nah nothing’s wrong with your toolbar…I was DEMOTED!! My delusions of grandeur finally caught up with me lol. It’s difficult to make a PageRank article entertaining but I’m happy you were able to get through it! I think the link has to be crawled number of time, then and then only Google considers it as a valid backlink, PR is the only factor behind which people run madly without knowing the exact policy behind assignment of page rank. One of my blog dropped PR rank from 5 to 4 and the same goes with the traffic when Google decides to push the SERPs to page 5,6,7 and deeper so no one would actually care to visit the links I have posted previously. It hurts my ads income greatly but the ultimate decision lies in the hand of Google. They are the big boss of the search engines. I think it’s about the Bounce rate. Bounce rate plays a vital role in page rankings. It’s how Google determine if your site is worthy to get high rankings and it’s how they distinguish sites providing valuable information to their readers. 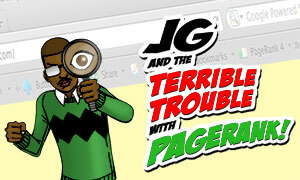 Yea, the Google PageRank thing is very frustrating since it’s hard to figure out why it works the way it does. I think I’d go crazy trying to figure it out so I just don’t worry about it, but I know you care about your site so you want to understand it. Good luck figuring it out! Wish I could help. Hi Rosie! yes Google keeps this stuff close to the vest to keep people from gaming the system, but i wish there were some better clues to how it works. I decided to stop worrying about it since it doesn’t seem to make much sense sometimes. I never checked the Mozrank before, so I went to take a look. Things are going to be up in the air for the google results. But I feel your pain. I had a website that was less than 3 months old and it received a PR1 with only 40ish backlinks. Whereas an older site of mine has considerably more backlinks but a PR 0. Not sure how Google does it unless they have human checkers randomly browse the net and offer higher PR to certain sites. PageRank IS very confusing, and Google is super secretive about it. It’s strange how PageRank can change for seemingly no reason at all, when the Panda update happened last year a lot of people were upset because of their rank changes. One of the things that seems important to PR is the amount of links that link back to your site, I’m sure you’re already out there blogging, but you could maybe start putting more links out there. PR 4 is definitely not bad though, but I do find it interesting that your other page is higher but much newer than this one. It may just be that this site is, in and of itself, an anomaly that you wont find much of in any other Google blog. I’ve perused the site, taking time to read some really cool stuff, and have to admit it is one of a kind even among sites that are fairly unique. Someone pointed out the lack of adsense too, which is certainly very important in terms of clearly providing a resource for people. I learned a lot on page rank today just by reading this post and the interactions in the comment section. Thanks!